What modern countries encompass the historic homeland of the ancient Maya? How do historians divide Maya history? What characteristics and events distinguish these periods? How did the Spanish conquest impact the Maya people? What right do indigenous peoples like the Maya have to self-determination? What right do more powerful nations like Spain – or even the central government of Mexico – to control the territory and lives of such peoples? History cannot be changed, of course, but would your answers change if you were discussing the United States and the Dakota Sioux? The Maya people of Mesoamerica have a rich history that can be traced back nearly four thousand years. Since around 2000 BC, the Maya have refined an extraordinary and vibrant culture all their own, distinguishing themselves with their glyphic script—the only known fully developed writing system of the pre-Columbian Americas—as well as for their art, architecture, mathematics, calendar, and astronomical system. The Maya world in Mesoamerica. This region was never controlled by any one Maya kingdom, but was instead made up of city-states in various states of alliance or rivalry. In various small city states, alliances, and diverse subcultures, the Maya have historically inhabited an area that encompasses modern day southeastern Mexico, all of Guatemala and Belize, and the western portions of Honduras and El Salvador. This region consists of the northern lowlands of the Yucatán Peninsula, and the highlands of the Sierra Madre, running from the Mexican state of Chiapas, across southern Guatemala and onward into El Salvador, and the southern lowlands of the Pacific littoral plain. The Preclassic period (c. 2000 BC to 250 AD) saw the establishment of the first complex societies in the Maya region, and the cultivation of the staple crops of the Maya diet, including maize, beans, squashes, and chili peppers. The first Maya cities developed around 750 BC, and by 500 BC these cities possessed monumental architecture, including large temples with elaborate stucco façades. Hieroglyphic writing was being used in the Maya region by the 3rd century BC. The Classic period, beginning around 250 AD, is largely defined as when the Maya were raising sculpted monuments with Long Count dates. This period saw the Maya civilization develop a large number of city-states linked by a complex trade network. In the Maya Lowlands two great rivals, Tikal and Calakmul, became powerful. The Classic period also saw the intrusive intervention of the central Mexican city of Teotihuacan in Maya dynastic politics. 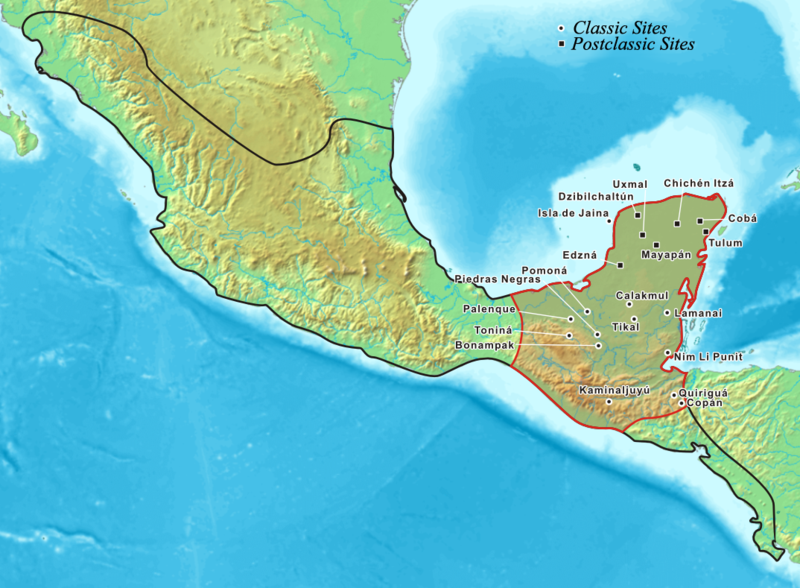 In the 9th century, there was a widespread political collapse in the central Maya region, resulting in devastating warfare between different cities within the Maya world, the abandonment of cities, and a northward shift of population. The Postclassic period saw the rise of Chichen Itza in the north, which was peopled by native Maya, but seemingly ruled by Toltec conquerors from central Mexico. In the 16th century, the Spanish Empire colonized the Mesoamerican region. The Maya were among the most resistant to conquest, but in the end, much of their culture was violently suppressed by the Spanish – an untold number of Maya books were purposely burnt, and the ability to read written Mayan was lost for centuries. A lengthy series of campaigns saw the fall of Nojpetén, the last independent Maya city, in 1697. The Spanish conquest stripped away many of the defining features of Maya civilization. However, many Maya villages remained remote from Spanish colonial authority, and for the most part continued to manage their own affairs. Maya communities and the nuclear family maintained their traditional day-to-day life. The basic Mesoamerican diet of maize and beans continued, although agricultural output was improved by the introduction of steel tools. Traditional crafts such as weaving, ceramics, and basketry continued to be practiced. Community markets and trade in local products continued long after the conquest. At times, the colonial administration encouraged the traditional economy in order to extract tribute in the form of ceramics or cotton textiles, although these were usually made to European specifications. Maya beliefs and language proved resistant to change, despite vigorous efforts by Catholic missionaries. The 260-day tzolk’in ritual calendar continues in use in modern Maya communities in the highlands of Guatemala and Chiapas, and millions of Mayan-language speakers inhabit the territory in which their ancestors developed their civilization.